The 2nd seed Denver Nuggets travelled to the Oracle Arena to face off against the top seeded team Golden State Warriors in a hotly anticipated match-up. Both teams were looking to get one over the other and the 4 game series was at a 1-1 deadlock. The Nuggets were coming into this win with a 43-21 record while the Warriors were leading the Western Conference with a 44-20 record. The match was a great one and it was the Golden State Warriors who came out on top, with a huge 122-105 win over the Denver Nuggets. Let us look at the 3 biggest talking points from this game. DeMarcus Cousins endured a rough season last year when his season ended early in a contract year, and it was an Achilles tear, something big men do not recover from easily. 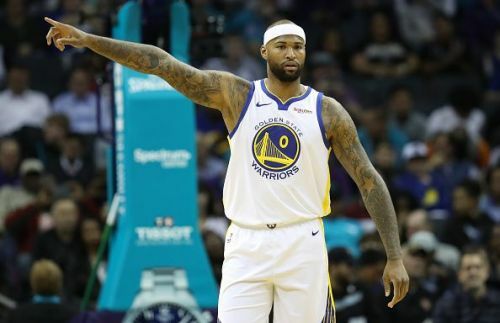 Boogie did not receive a maximum deal in the summer but signed with the Golden State Warriors, and ever since returning to the court in 2019, he has slowly and steadily gotten better, game after game. He has been averaging a solid 15.3 points per game, along with 8 rebounds and 3.4 assists as well in 25 minutes per game. His minutes have slowly gone up and so has his production. In the game against the Denver Nuggets last night, Boogie scored 13 points, shooting under 50% from the field, making 5 of his 11 attempts in 28 minutes. He also had 6 rebounds and made 6 assists as well. But his biggest contribution was on the defensive end, where he kept Nikola Jokic quiet, grabbing 3 steals and 6 massive blocks, which was a huge improvement from the other games he has had this season. If the Golden State Warriors have Boogie playing at his best, there will probably be nobody who can take them down this season.